Scientify offers a best match for your needle driver that comes with a 20-pack, 4-0 reverse cutting sterile nylon sutures with 20mm 3/8 curved circle reverse cutting needle that ultimately provide all students with the best experience. Our needle is of eyeless type to avoid threading and is time efficient. It made of high quality stainless steel with silicone coated sharp end for easy piercing. These are slim and specially designed without compromising for strength and are rigid enough to resist bending and breaking. 3/8 curvature makes it easy to manipulate large wounds on a suture pad and therefore great suturing experience. 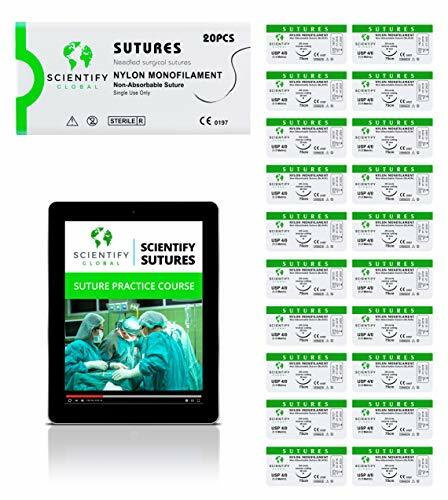 Our Suture is 75cm long BLACK monofilament non-absorbable nylon with uniform diameter crimped to a needle. Made of high-quality material and provides high tensile strength that is perfect to hold the cuts securely and is flexible enough to be knotted. Our product is for training and instructional applications only. Not for human use. Have these perfect sutures to make a right fit to your needle driver. Click ‘Add to Cart’ right now and order yours today! LIFETIME WARRANTY - Love Them or We'll Buy Them Back From You. No Questions Asked! If you have any questions about this product by Scientify, contact us by completing and submitting the form below. If you are looking for a specif part number, please include it with your message.